Community Service | Tar Heel Basement Systems Gives Back! Community Service | Tar Heel Basement Systems Gives Back! Established in 2013, the Tar Heel Basement Systems’ Pay It Forward Initiative has positively impacted dozens of non profit organization in North Carolina and Virginia. From fundraising and supply drives to cooking meals at the Ronald McDonald House, the employees at THBS do whatever it takes to give back to the local community every month. We stand by our mission statement of “improving the lives of everyone we encounter” and believe that one positive action can create a ripple effect, which can positively impact our communities. Collect and distribute “survival kits” containing essential items to Northwest NC & Southwest VA’s homeless population. Employees will participate in the walk around Winston Salem to fundraise for the AHA & promote physical living and healthy activity. 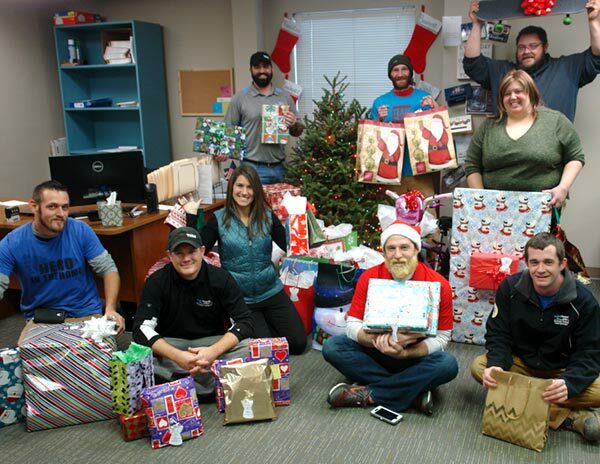 Employees select children from the tree and buy holiday presents for them based on their wish list. Are you a non-profit looking to collaborate with us? Contact us here! Tell me about your organization and how you'd like to partner with us. Please limit your response to 1000 characters.